Anubias plants are very easy to maintain and are perfect for beginners. They are commonly used in aquariums in pots, planted in gravel or attached to driftwood, rocks or bogwood. Live Anubias plant bundle prefer subdued lighting and can also produce flowers underwater. In the aquarium they should be placed in shaded areas, otherwise algae will develop on the leaves. 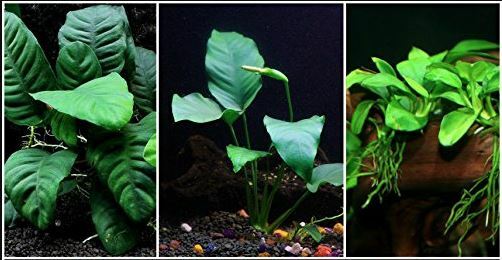 Anubias are considered to be some of the easiest plants to maintain, since their light and nutrient requirements are very low and also because herbivorous fish will not eat them. This is why Anubias are some of the few plants which can be used in aquariums with African cichlids and goldfish. Reproduction in artificial environments can be accomplished by stolon division or from side shoots. The stolon must always be above the substrate in order to survive, otherwise it will rot and the plant dies. The natural growth rate of all species in this genus is slow. Usually, they produce a leaf every 3 weeks, or even slower. And while they were once thought to be among the few plants that do not respond to CO2 addition, hobbyists have seen great results and improved growth with CO2 and high light intensity. Anubias are very common in all aquariums due to their low maintenance. This plant is perfect for hobbyists who are just starting with planted aquariums. They also do well in high temperatures which makes them perfect for discus fish aquariums. The best part about the plant is that fish will not eat them! No need to worry about having ugly partially eaten plants in your tank.